Who was reached by the campaign? What impact did contact with the campaign have? The Los Angeles County Department of Mental Health recently undertook a community engagement campaign that sought to increase awareness of mental health access as a civil rights issue and increase civic engagement. The WeRise/WhyWeRise campaign was composed of a website (whywerise.la); social media outreach through Facebook, Instagram, and Twitter; and, as its centerpiece, the WeRise event, an immersive experience in downtown Los Angeles in which visitors were exposed to an art gallery, rally, performances, panels, and workshops. To evaluate how well the campaign met its goals, RAND conducted an in-person survey of WeRise attendees; a social media analysis of Twitter conversations related to WeRise/WhyWeRise, mental health, mental illness, and well-being; and a web-based survey of a broader population of Los Angeles youth in the age range targeted by WeRise/WhyWeRise. 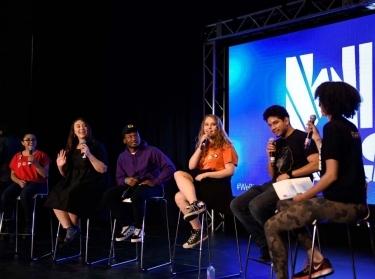 Overall, the evaluation found evidence that the WeRise/WhyWeRise mental health campaign had impressive reach into the Los Angeles community, with one in five young people exposed to the campaign in some way during the brief period examined. There is early evidence that the campaign might be associated with positive outcomes, such as increased supportive and understanding attitudes toward people with mental illness, awareness of the challenges people with mental illness face, knowledge of how to get help for mental health challenges, and, importantly, empowerment and mobilization toward activism around mental health issues. As many as one in five young people were aware of WeRise or WhyWeRise. WeRise was successful in engaging racial and ethnic minorities, especially black and Latino teens. The WeRise/WhyWeRise campaign was associated with a moderate increase in Twitter discussion of mental health and well-being. The in-person survey at the event found that those who were present for longer were more likely to express supportive and understanding attitudes toward people with mental illness. The large, countywide survey of youth found that those exposed to WeRise or WhyWeRise (either in person or online) were more likely to report feeling empowered and mobilized toward mental health activism — a key goal of the campaign. Those exposed to the campaign also had greater awareness of the challenges people with mental illness face, from stigma to treatment-access issues. They were also more likely to know how to get help for their own mental health challenges, consistent with one of the campaign's goals of connecting people to resources. The campaign successfully attracted people for whom mental health was personally relevant, who can readily apply the knowledge and empowerment they get from the campaign to their own life situations. The campaign seems to have had better success engaging people through means other than the event. The campaign should consider using approaches aimed to reduce negative stereotypes and increase mental illness–related knowledge. Future events could focus on engaging men, younger audiences, and those who do not already have a connection to mental health. The campaign could work toward building stronger social media connections between "mainstream" and social justice–oriented online communities. Public attitudes tend to be slow to change, so the campaign should keep doing what it is doing. The research described in this report was funded the California Mental Health Services Authority (CalMHSA) and conducted by RAND Health Care. 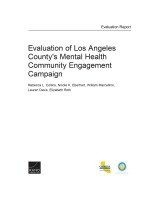 Collins, Rebecca L., Nicole K. Eberhart, William Marcellino, Lauren Davis, and Elizabeth Roth, Evaluation of Los Angeles County's Mental Health Community Engagement Campaign. Santa Monica, CA: RAND Corporation, 2018. https://www.rand.org/pubs/research_reports/RR2754.html.